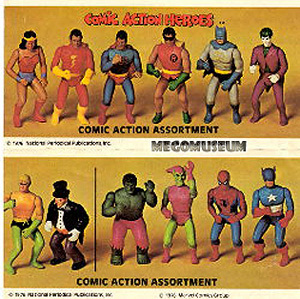 In 1976 Mego debuted the Comic Action Heroes, Mego was looking for a way to captilize on the success of their entirely successful Worlds Greatest Superhero line. 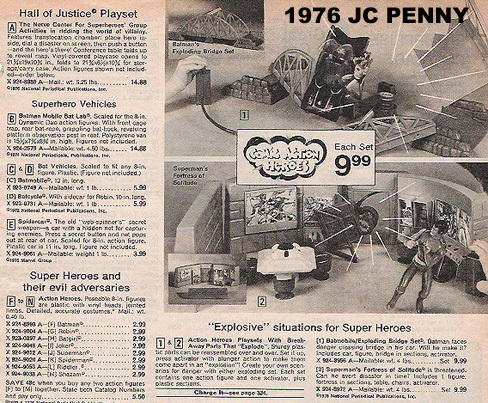 Mego decided that series of playsets and vehicles and "pocket sized" figures would augment the license without as Neal Kublan put it "pirating sales from the core (ie 8" Superhero) business". According to Mr Kublan, the line saold "Good, not great" but it should be made known that from it's 1976 debut, Mego produced a 3 3/4" Superhero line until it's demise in 1982. The figures themselves are otenf considered crude by today's standards, their bodies are crouching (no doubt to help them get into their vehicles) and there is a lack of facial paints. However it should be noted that the Comic Action Heroes is the first licensed 3 3/4" line ever, so it truly is an innovative creation that most likely inspired others. The body style (including the orange stands) was also used for Mego's CB Mchaul line of Action Figures. 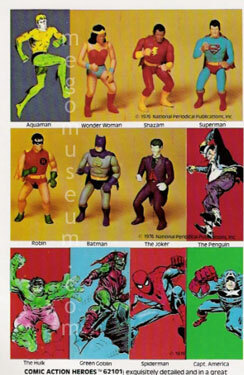 Click on the above link to see Comic Action Heroes packaging from around the world! The average retail on these were $9.99 for the large sets, while the individual figures averaged $0.99 a piece. 12 Figures in the Line: Batman, Robin, Superman, Aquaman, Wonder Woman, Spiderman, Hulk, Captain America, Joker, Penguin, and Green Goblin. Joker came with a cane, Penguin an umbrella, Wonder Woman a lasso, Batman and Robin with Batropes (identical to the ones pictured in Pocket Heroes) and Cap had a sheild. The rest came without accessories, but all had a hole in the fist that makes them look like they need something. 8" Mego never got the luxury of such nice accessories, Joker's Cane, Wonder Woman's Lasso, Batman (and Robins) Batrope and of course, the Penguin's umbrella. In addition, there were a number of playsets produced.